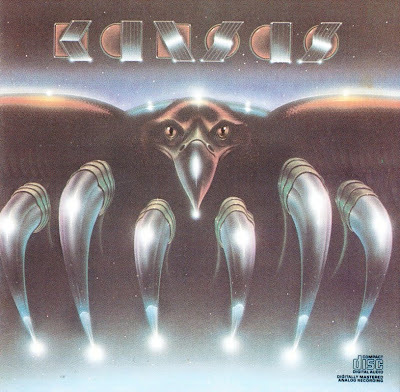 Song for America is the second album by American progressive rock band Kansas, released in 1975. The album was reissued in remastered format on CD in 2004. Continuous touring had given Kansas a small following of loyal fans, some of whom would follow the group from one show to another. Despite the minor success of their debut album, they were still, for the most part, a struggling bar band. While Song for America did little to change that, it is their most progressive and heavy work, as their next albums would transit into a softer format. Like the first album, the writing duties were divided between Kerry Livgren and the former members of White Clover, mostly vocalist/keyboardist Steve Walsh. Musically, Song for America features complex arrangements for electric and acoustic guitar, violin, and keyboards (including piano, organ, and Arp and Moog synthesizers). Walsh’s songs reflected life on the street ("Lonely Street"), drug dealing ("Down the Road"), and temptation by Satan ("The Devil Game"). Livgren’s lyrics to "Lamplight Symphony" are centered on Christian themes, while those of "Song for America" have an environmentalist basis, both of which are reoccurring themes in his work. "Incomudro" deals with the Buddhist / Hindu concept of the atman. The 10-minute title track was edited down to three minutes for release as a single. The 45" edit resurfaced 29 years later as a bonus track on the remastered release, which provided improved sound as well as expanded liner notes, rare photos, and a live version of "Down the Road".